Ever since watching Star Trek, I’ve been fascinated by shapeshifting’s potential uses for military and law enforcement. Now, The Economist (11 December 2010) reports that shapeshifting material, or “liquid armor,” is being tested by BAE for high-tech body armor. Traditional body armor contains about 30 layers of protective Kevlar; however, by using the new material between the protective fibers, BAE is able to reduce the layers of Kevlar to just 10, making for lighter and more comfortable protection. In the body armor, when the fluid sandwiched Kevlar is struck by a bullet, the molecules in fluid lock together and spread the impact, thereby absorbing it more effectively. This seems like an exciting development applying chemical engineering to protecting the warfighter and law enforcement officers. What is also so cool is that the concept of shapeshifting being a potent force showed up almost two decades ago in movies and television—and once again we have life imitating art (so to speak)! Hollywood captured the shapeshifters in both the movie Terminator 2: Judgment Day (1991) and Star Trek: Deep Space Nine series (1993-1999). In Terminator II, a shapeshifting cyborg is sent back in time to try and kill John Connor, the leader of the resistance against the cyborgs. The shapeshifter takes on the form of the various people and things to try and get Connor, but ultimately in thwarted by the original Terminator (played by Arnold Schwarzenegger). Similarly, in Star Trek: Deep Space Nine, Otto is a shapeshifting constable on the space station that protects the station and the Star Fleet command making frequent use of his abilities to shift forms, but always returning at rest to his liquid state to rejuvenate. I’ve got to say that I applaud Hollywood and continue to see it as not only a creative core for our entertainment, but also a prescient forbear to technology and events to come. The new Google Body Browser (released 16 December) provides an incredible view into the human anatomy. This is the a long way from the classic Anatomy of the Human Body by Henry Gray (1918). I'm looking forward to seeing the hologram version some day soon. All this may just be cool enough to make me want to go back and become a M.D.! Recently, I was watching the new ABC News broadcast called “Be The Change: Save A Life.” And in this one episode, a group of Stanford University students solved a critical life and death problem afflicting the world in which 4 million premature and malnourished babies die every year due to hypothermia and another 16 million that survive suffer life-long illness such as diabetes and heart disease because their internal organs do not form right. The challenge in the developing world is access to incubators, which typically cost $20,000 and are not available in rural areas. In turn, some Stanford students formed a team and developed the Embrace infant warmer, a low-cost, local solution. It is a $25 waterproof baby sleeping bag with a pouch for a reheatable wax-like substance that is boiled in water and maintains its temperature for 4 to 6 hours at a time. It is hoped that this product will save 1 million babies within the first five years in India alone! As I reflected on this amazing feat of technology, I marveled at how this group of young adults was able to overcome such a big world problem and solve it so simply. And while I understand that they focused on the end-users and the root cause of the problems, it is still a remarkable story. Idealism—the students had a shared idealism for a better world. Seeing people’s pain and suffering drove their vision. And in turn, they committed themselves to finding a cure for it. Embrace is now a non-profit organization seeking to save lives versus just making a profit. Imagination—the product team was able to imagine an unconventional alternative to the status quo. They were able to project a vision for a low cost and mobile infant warmer into concrete solutions that were user-centric for the people in need. Innovation—the ultimate product design was truly innovative. It marries a high technology phase-change wax substance for maintaining body temperature with a simple baby sleeping bag. Moreover, the innovation is not just in the materials of the product, but in the usability, so for example, this product requires no electricity, something that is not always available in rural India. While, there are certainly many factors that go into successful technology product launches, including strong leadership, sound project management, and the technical competence of the team, I think that the Triple I factors—idealism, imagination, and innovation—albeit soft factors are ones that should not be underestimated in their ability to propel meaningful technology solutions. As IT leaders, we need to create a healthy balance and diverse competencies in the organization between the hard factors and the soft factors, so that we can tackle everything from children dying from malnutrition and hypothermia to cures for cancer, and of course, ongoing IT breakthroughs in knowledge management, social engineering, and human productivity await. What's Next For Microsoft, Google, And The Rest Of The IT Industry? For some people, like Madonna, the “material world” represents a society where people must pay to get their way. To me it means the mortal world, where we are born, live, try to thrive and ultimately pass the baton to others. A curious irony runs throughout these conversations. Microsoft and Google are seemingly on top of their respective games, dominating the market and earning tens of billions in revenue per year. Despite being at the pinnacle of the technology industry, various industry watchers have noticed, they appear unable to see what’s the next rung on their ladder. It’s almost like they’re dumbfounded that nobody has placed it in front of them. Consider, for example, that Microsoft dominates desktop operating systems, with approximately a 90 percent share of the market, business productivity suites at 80 percent and browser software at 60 percent. Google similarly dominates Internet search at about 64 percent. Everyone is asking: Why can’t these companies find their next great act? Microsoft launched the Kin and dropped it after less than two months; Bing has a fraction of Google’s market share in search; and Windows Mobile never became a major player as an operating system. Further, as The Wall Street Journal pointed out, the Xbox video game system, though finally profitable, Microsoft will likely never recoup the initial investment in research and development. Similarly Google gambled by acquiring the ad network DoubleClick in 2007 for $3.1 billion, YouTube in 2006 for $1.6 billion and the mobile ad platform AdMob in 2009 for $750 million. But so far, as Fortune noted, Google hasn’t seen significant benefit from these purchases in terms of diversifying its revenue stream. “The day is coming when … the activity known as ‘Googling’ no longer will be at the center of our online lives. Then what?” said The Wall Street Journal. From the perspective of organizational behavior, there’s a natural law at work here that explains why these resource-rich companies, which have the brains and brawn to repeatedly reinvent themselves, are in apparent decline. All organizations, like all people and natural organisms, have a natural life cycle — birth, growth, maturity, decline and death. To stay competitive and on top of our game, we constantly must plan our strategy and tactics to move into the future. However, organizations, like people, are mortal. Some challenges are part of life’s natural ups and downs. Others tell us we are in a decline that cannot be reversed. At that point, the organization must make decisions that are consonant with the reality of its situation, salvage what it can and return to the shareholders what it can’t. In other words, eventually every organism will cease to exist in its current form. During its life cycle, it can reinvent itself like IBM did in the 1990s. And when reinvention is no longer an option, it goes the way of Polaroid. This is similar to technology itself. As a new technology emerges, time and effort is spent further developing it to full capacity. We optimize and integrate it into our lives and fix it when it’s broken. But there comes a time when horses and buggies are no longer needed, and it’s time to face the facts and move on to cars — and one day, who knows, space scooters? Going back full circle to the human analogy: People can reinvent themselves by going back to school, changing careers, perhaps remarrying and so on. But eventually we all go gray. And that’s fine; that’s the way it should be. Let’s reinvent ourselves while we can. And when we can’t, let’s accept our mortality graciously and be joyful for the great things that we have done. There is a huge need for speed on our networks—as we demand the latest and greatest download streaming of books, movies, games, and more. The network generation (or mobile telephony) standards have evolved to soon to be 4th generation (or 4G). While 3G standards require network speeds for voice and data of at least 200 kbit/s, the 4G-performance hurdle jumps (500x) to 100 mbit/s. The chart from Wikipedia shows the various standards and how they have evolved over time. 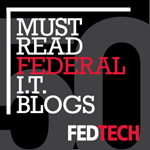 In the second, vendors and technologists should understand that they are losing the consumer when they talk “techno-geek.” Instead, all need to use plain language when communicating, and simplify the technical jargon. The comic in Computerworld (22 November 2010) summarized it well with pictures of all the various GGGG… technologies and the people next it to it saying, “At this point the labels are ahead of the technology.” Of course, I would add that the labels are also ahead of most people’s ability to understand the geek-speak. And we need to fix the communications of both. New IT management reform from the White House. The plan is published at this link. 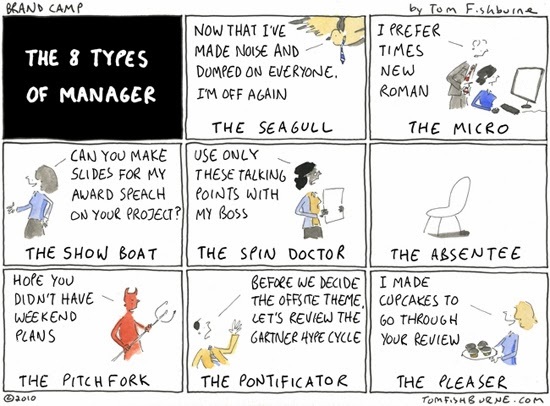 Here's a funny cartoon by Tom Fishburne on "The 8 Types of Manager"
University of Virginia professors teaching a leadership class that I was fortunate to participate in shared lessons on this. Essentially, studies show that leaders that treat their people with trust, caring, and respect—what I would call the basic elements of human dignity—are able to achieve the multiplier effect. In simple terms, what you give as a leader is what you get back. Multipliers—leaders that are “multipliers” believe in their people—that they are smart and will figure it out. 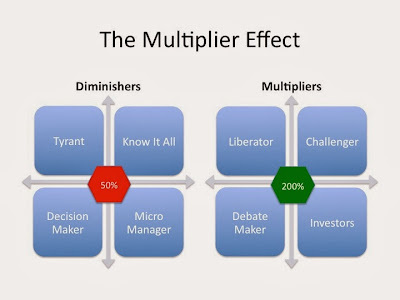 Multipliers guide them, invest in them, give them the freedom to debate the issues and do their jobs, and they challenge them to be their best. Multipliers are "talent magnets"--people want to work for them, and employees that work for multipliers tend to contribute 200%! In contrast, those managers that are “diminishers” believe that their employees will not figure it out without them. They are empire builders and micromanagers, who typically act like tyrants, displaying a know-it-all attitude, and they have to make all the decisions. In an un-empowered and disrespected role, employees who work for diminishers withdraw and give less than 50%. When it comes to motivating our workforce and achieving a multiplier effect, while money and recognition are important, providing genuine autonomy and empowerment to “own the job” and get it done has been found to be the #1 impact on their productivity. Hence there is a big difference between using technology as a tool to perform a task and doing it in a very directed way (by rules, algorithms, assembly lines, etc.) versus working through real people who have important human needs to work with some autonomy to add value and achieve not only the respect of their manager(s), but also self-respect as well. When we create a multiplier environment for our employees—one where they can flourish as human beings—they give back rather hold back, and in a highly competitive environment that’s exactly what every organization needs to thrive. There are two major challenges here for leaders. One is that leaders who have attained power tend to be reluctant to relinquish any of it to their employees. They don’t see the difference between “empowerment” and their own loss of stature. The other challenge is that there is always the chance that if you give somebody the tools to build the house, that they will either take a nap in the hammock in the backyard or even try to throw you off the roof! In the first case, the leader has to have enough confidence to make room for others to succeed. I once heard that Jack Welch said of great leaders that they surround themselves with people who are even smarter than they are. In the second case, I believe that we need to “trust but verify,” meaning that we provide autonomy and tools to people to do the job, but then if they don’t do it appropriately, that is addressed through individual performance management. Managing people well is not a favor we do them, but is something that is required for the success of enterprise. This video was just great! This is a world target architecture that I can buy into, any day. Someone sent me this beautiful poem; I hope you find it as meaningful as I do.